It was a cold winter night of January when me and my husband lazying and trying to keep ourselves warm with a room heater, our 1.3 yrs old daughter was also keeping herself busy with toys, then suddenly while watching “highway on my plate” an idea struck to visit Amritsar came and without further delay we booked our tickets in Delhi-Amritsar Shatabdi for the coming weekend. We were fortunate as it was lohri (harvest festival) when we had planned this trip and saw colorful, religious Amritsar which is famous for its food, Golden Temple, and Sikh’s bravery Tales. I was very excited as soon as our Shatabdi hit the platform, it was the first time ever I was visiting Punjab. The first thing which come to my mind whenever I think of Punjab is its food- Chole Kulche, Lassi, Sarso da saag and makke ki roti , Ma ki Daal to name a few… but I have to control my taste buds for the next day as we already had dinner in train so we straightaway gone to Air force Officer’s mess where we had our room booked. It was 8’o clock in the morning; we had breakfast and were ready to explore the city. My husband’s course mate was posted to Amritsar so we were lucky that he agreed to become our host and guide for the city. We parked the Car at nearest Car parking meant for Golden Temple Visitors and choose to walk for about 1.5 km on the road which leads us to Golden Temple. On the way, you can see numerous shops selling Orange color flag with Sikh symbol printed to them, bejeweled Swords, souvenirs etc. 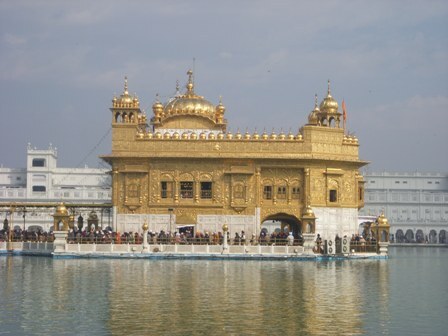 Golden Temple, which is the Sikhism’s holiest shrine and place for the holiest Sikhist’s pilgrimage. People from all over the world visit this place; it is open for all people of any religion. First, we had to remove and leave our shoes outside in the shelves, then we had to cover our heads, I with the shawl and my husband put his handkerchief, I put a monkey cap to my daughter, we washed our feet before entering. The temple is a Visual Treat as it is actually made up of Gold. The serenity and beauty of this place is mesmerizing. The temple has the long line to enter. Continuous chants of Onkar, Stillness of the water making it divine. 100’s of people providing service for nothing in return, anyone can provide his/her service in any form. They have a Kitchen (Langar) which is open for all and feeds lakhs of people daily for free without any religion bias. The entire kitchen is run by volunteers who work in shifts and anyone can be part of this team and do Sewa . We took some Prasad (made up of jaggery) wrapped in orange cloth and head towards the main temple, a priest was sitting behind the huge book (Guru Granth Sahib) and reading chants from it. People were sitting around praying, chanting and listening. We offered our prayers too and came out and saw many big orange-golden fishes swimming in the pond. 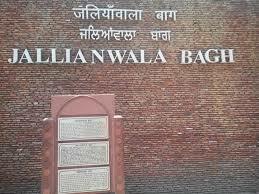 We walked out of the temple and took our shoes from the shelves and proceed to Jallian wala Bagh. 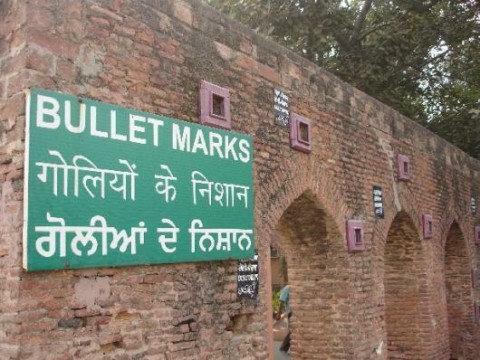 This place is very close to Golden temple complex and made in remembrance of massacre done by British on April 1919. Hundreds of People lost their lives. You can Still Saw the bullets marks on the walls. It has a Public Garden too. By the time we finished seeing these two places. ..It is already lunch time and hunger pangs started coming. Our Friend and Host suggested Brother’s da dhaba to satisfy our cravings. We had ordered Sarso da saag and chole kulche and as expected it was awesome, delicious and yummy which fully satisfy our taste buds!! We end our lunch with a huge glass of sweet lassi served in khullad (earthen pot) . Our next destination was Wagh Border to look India –Pakistan Border. 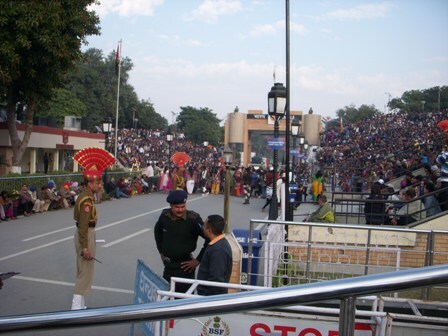 Every evening you can witness the fun filled and competitive Beating retreat (lowering /rising of flags) ceremony. We reached the place on time and secured a place from where we can see the parade. Dancing and trying every possible way to outshone Pakistani side. On the other hand it was quieter and much less audience at Pakistani side. 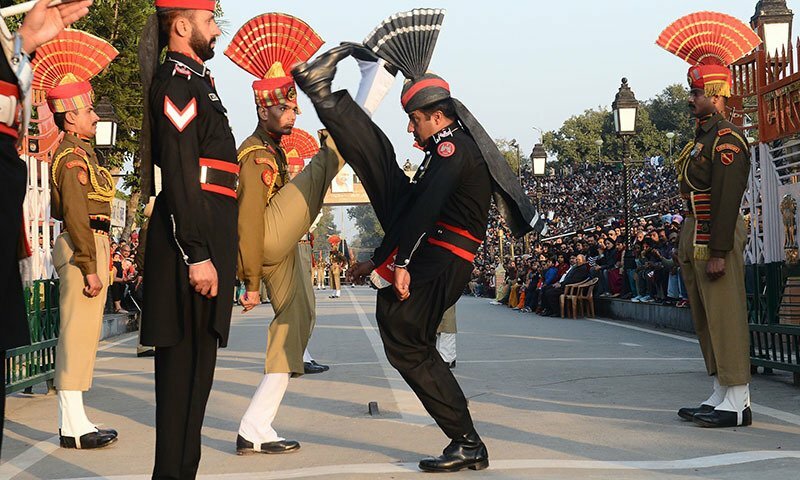 When the gates opened the guards from both countries met in the middle stamping, marching and thumping their feet in really aggressive manner. Watching all this is truly an incredible experience which invoked the sense of patriotism in every Indian. We end our Day with Hot and lip Smacking Jalebies. As it was very cold outside we head towards officer’s mess to rest for the day!! We reserved this day to roam around Amritsar and went to old city market to shop famous Phulkari (traditional embroidery), Patiyala Salwars. All girls shopping yeee!!! We wander through narrow lanes of the market and search some authentic shops to buy saari and salwar suits. It is always Fun to do shopping. We found some hawkers selling rabdi and had it too!! Our train back to Delhi was in the evening so after returning we packed our bags and head towards railway station with the memories and souvenir of Amritsar. Special Thanks to Our friend and Host who made this trip truly special!! Previous Previous post: Where the Lands Down – Landsdowne !! !